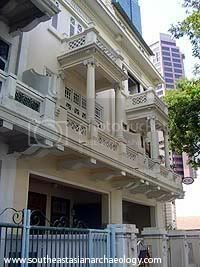 Along Singapore’s Cantonment Road, just at the edge of the central business district, a line of three old houses lie. They don’t sit on any particularly valuable real estate – in fact, the stand side-by-side to some low cost apartment housing. In short, they’re not the kind of house that you pay attention to when you’re passing by on the street. Yet the house in the centre holds a most surprising museum collection, a private museum called the Nei Xue Tang (roughly translated as “The Hall of Inner Peace), home to some 10,000 pieces of Buddhist art with examples from different styles, regions and periods from around the world. This, of course, includes examples of religious sculpture from Southeast Asia. 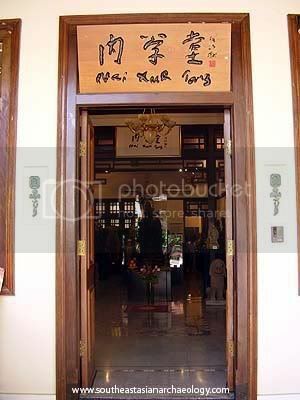 Nei Xue Tang is the first private museum opened in Singapore. 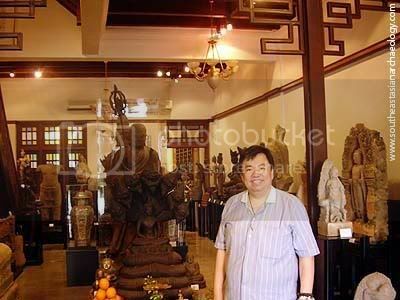 It is owned by Mr W. T. Woon, a lawyer and a devout Buddhist himself, who has been collecting Buddhist antiques since he was seven! The museum is a culmination of over 40 years of collecting Buddhist antiques – many from his own collection, and some others donated or bequeathed to Nei Xue Tang from corporations and individuals. In the collection, you’ll find examples from Sri Lanka, India, Nepal and the different Chinese dynasties, but it’s the ones from Southeast Asia that I’ll be writing about, this post and next. 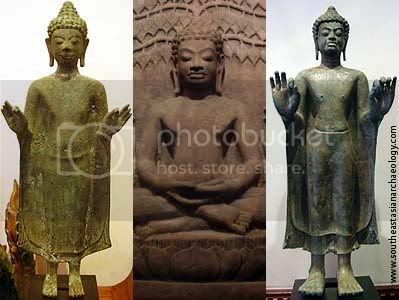 These three Buddhas are examples of Mon-Dvaravati art from Thailand. From left to right, they are: A bronze Buddha; A Buddha seated under a Bodhi tree; and another bronze Buddha. All of them date to around the 8th century. Little is known about the Dvaravati period on Thailand (6-11th centuries). The kingdom was centred around Central Thailand and seems to have played an important role in the spread of Buddhism to the rest of Southeast Asia. Later in history the Mon people seemed to have been assimilated into the growing influence of the neighbouring Khmer and Burmese empires. As is typical of many of the Hindu and Buddhist art from Southeast Asia and Asia, many of these artefacts are unprovenanced, and it has taken years of collecting experience for Mr Woon to provide information about what style and region the artefact came from and its approximate date. Sadly, the archaeological context of these artefacts may well forever be lost. I have a sense of ambivalence while looking through exhibits at Nei Xue Tang, at once marveling at all the different styles of Buddhist sculpture under one roof, and at another a sense of sadness of how so much cultural heritage has been removed from its context, unable to tell any more stories. Still, it’s nice to see a private collector open his collection up for the public to enjoy, and experience the breadth of expression in Buddhist art. In part 2 of this article, we’ll take a look at some Khmer sculpture, and also some Khmer inscriptions. Nei Xue Tang is located at 235 Cantonment Road, Singapore 089766. Admission is $5 for adults and $3 for children and the museum is open daily from 10 am to 5 pm. The museum also has a website.